This September the Running in Iceland team decided to take part in all the races we possibly could. In total we participated in six races, only two of which we had ran before. We had a great time, as we always do! The race in the volcanic Westman Islands has quickly become one of our favorite races. The hospitality of the locals, the swimming pool after the race, top restaurants, great hotel and of course a very scenic half marathon tour of the island Heimaey, the biggest of the Westman Islands makes it the perfect getaway. A VERY windy day (19 m/s) even made it more fun, with headwind up all the hills and tailwind downhill! More on this race later. For the first time, we took part in a race where the runners were started one at a time, based on age-grades performance standards. The experience was very different from the regular races but a lot of fun. It was a big challenge to catch the older runners in front of you, who in many cases were of course were much fitter than their younger rivals. And trying to keep the fresh younger runners from overtaking you. The weather was great and we really hope this becomes a regular event. A charity race on one of our favorite running routes. It was a windy Sunday morning but as always the weather was much better than it looked. During the race we felt a bit tired from the weeks exertions and felt very happy to cross the finish line near Nautholsvik geothermal beach. Everything about this race is very well setup with great indoor facilities and lots of prizes not only for the winners but also drawn from the name of all finishers. 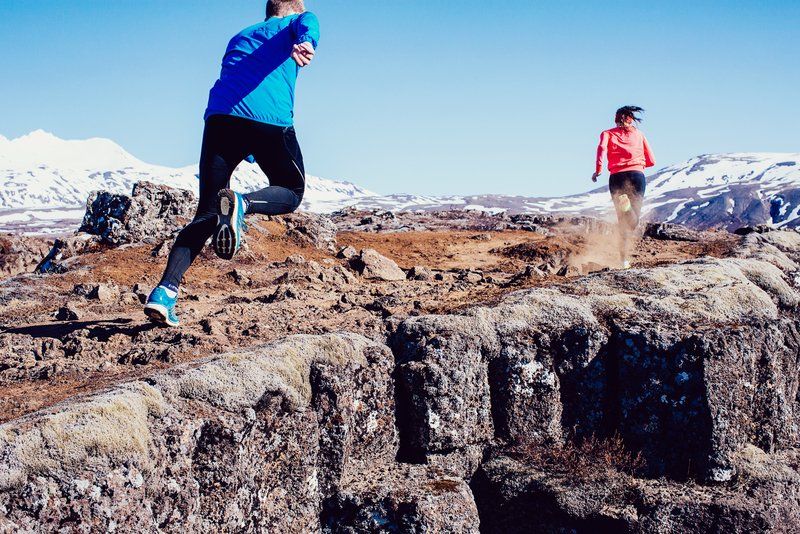 A great race in one of Iceland’s most beautiful places, and we really mean that! Þórsmörk is the place where the famous Laugavegur Ultra Marathon ends, and this 12km course is just as stunning. After the race we had a fantastic time enjoying the generous refreshments and chatting to old and new friends. Again, we will be writing more about this race later. Another charity race in a fantastic weather. The race takes place in Hafnarfjörður very close to Reykjavik, on a rolling course out of town towards Helgafell mountain. We got stuck in traffic and arrived only a minute before the start so we decided to treat the first half of the race as a warmup and the second part as a 5K tempo run. The race is part of the Flensborg School athletics programme so a lot of high school kids take part. After the race there were great refreshments, including soup inside the Flensborg school. The third charity race in September was the held by the Icelandic Heart Association. The start of the race was practically in our backyard and we were very keen to race on the well-known paths in our neighborhood. The weather was not on our side this time, with heavy wind and relentless rain. Somehow, the headwind always seems to slow you more down than the boost from the tailwind! We came soaking wet so it was extra sweet to cross the finish line this time. After the race, there were raffle prizes and refreshments. All in all, we had a fantastic month, and it struck us how high the standard is as even the smaller races are very well organized and have excellent facilities. Participant prizes won: 1 entry to the Eco Trail Reykjavik race in 2018, a meal for 4 in KFC, a day in a Reykjavik spa, and lots of cosmetics.